When you’re having a cosy night in and you just want to throw some things together and make a very hearty meal, then this is the dish for you! 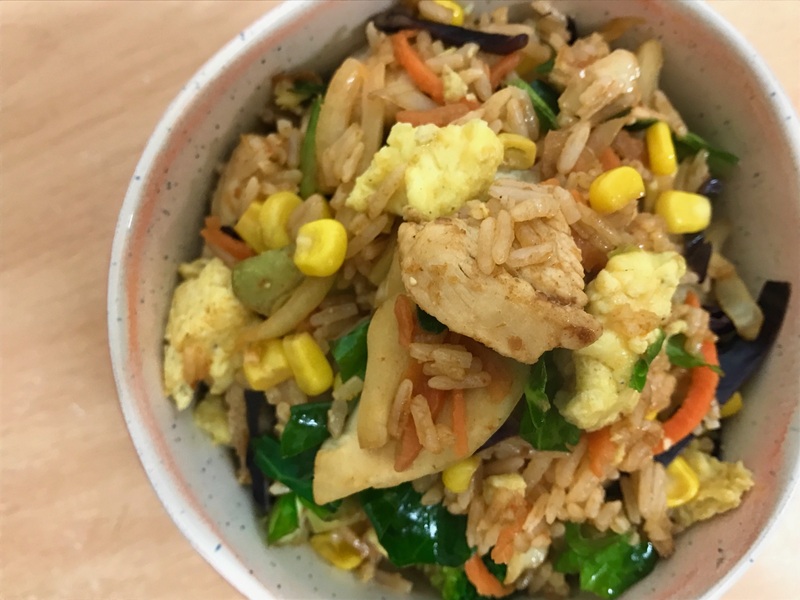 Spice it up with some chilli flakes or make it completely veggie and take out the chicken, or alternatively throw in some tofu instead. Really easy, really quick with most things found in your kitchen already! 1. Heat a splash of oil in a large frying pan and tip in the beaten eggs. Swirl the pan to coat in a thin layer of egg and cook for a few mins until set. Tip onto a chopping board, roll up, slice thinly and set aside. 2. Heat a little more oil, add the stir-fry veg, curry powder and sweetcorn. Cook for 1-2 mins until the veg starts to wilt, then tip into a bowl. Add the last of the oil to the pan, tip in the rice and chicken, mix well, then add the soy sauce, sweet chilli, ketchup, a splash of water and some black pepper. 3. Finally, add the eggs and the veg, toss together and heat through until hot. Tip into bowls and serve immediately. This looks like the perfect meal which I could rustle up for me and my boyfriend quickly one evening! This looks wonderful! I must say though, sweetcorn is my worst nightmare – I hate it so much that every single person I know knows about my hatred of it. 😀 It's funny because it's my sister's favourite thing and she has piles of it with everything – maybe I should send this recipe to her!